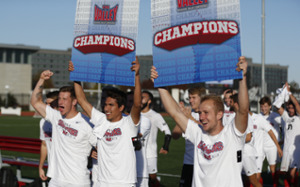 Devyn Jambga's goal in the 37th minute stood for SIUE as the Cougars claimed their second Missouri Valley Conference Tournament Championship in three seasons with a 1-0 win over host Missouri State Sunday at Allison South Stadium in Springfield, Mo. SIUE will appear in its 23rd NCAA Tournament. The Cougars will now wait to find out their NCAA Tournament first round opponent. The selection show is Monday at noon (CT) and will be shown live at NCAA.com. SIUE (10-4-5) extended its unbeaten streak to 12 games (9-0-3). Jambga’s goal came after an outstanding effort on the part of the Cougars striker. He made a run from the left, cutting into the center then unloaded a shot from the top of the penalty area with a low shot to the near post. Sanchez wanted the Cougars to maintain their composure, knowing that Missouri State was playing with high emotion at home aiming for a conference title. “I was always confident that we could hold them at bay,” said Sanchez. “It takes one shot, and we got it,” he added. Cougars keeper Kyle Dal Santo made three saves to notch his eighth shutout of the season. It also is his 19th career shutout, tying him for fifth all-time at SIUE with SIUE Hall of Famer Rick Benben. Sanchez also thanked SIUE Director of Athletics Dr. Brad Hewitt.